The big guys at the gym drink them, so why not you? Weight-gaining supplements like Precision Engineered Muscle & Weight Gainer pack loads of calories and protein into a few scoops of powder. But gainer supplements only help your muscles grow if you're putting in the time at the gym, and in many cases you can gain without them. If you're trying to put on pounds and considering a weight-gain supplement, consult your doctor first to discuss options. Precision Engineered incorporates a lot of calories, protein, vitamins and minerals into its Muscle & Weight Gainer supplement. One serving, which is four scoops of powder, has 550 calories, 74 grams of carbs, 54 grams of protein and 6 grams of fat. Whey, casein and egg whites make up the protein, while maltodextrin and fructose provide the carbs. Two artificial sweeteners, sucralose and acesulfame potassium, are also ingredients. The supplement is fortified with vitamins and minerals, and one serving meets 50 percent or more of the daily value for vitamins A, C, D and E, niacin, thiamine, vitamins B-6 and B-12, calcium, iron, zinc and chromium. The product even contains 4 grams of fiber per serving, from added soy and oat fiber. To add even more calories and protein, the manufacturers of Muscle & Weight Gainer suggest you mix the four scoops of powder with 2 cups of whole milk. This bumps the total calories in the drink to 850 calories and protein to 70 grams, but it also ups the total fat to 22 grams. If you're concerned about too much fat in your drink, substitute skim milk, which drops the fat back to only 6 grams per serving. Directions on the label suggest blending the powder with berries, bananas, nuts, nut butters, honey or ice cream to add more calories for faster weight gain. If getting the calories you need for weight gain is difficult, supplements such as Muscle & Weight Gainer are an easy mix-and-go meal replacement or between-meal snack. They're convenient for a post-workout meal, too, because their carb and protein content fits the bill. Eating a snack containing carbs, protein and fluids within 30 minutes of the end of your workout helps build muscle and replenish energy stores. Muscle & Weight Gainer may provide more calories than most people need, however. Weight-gain calorie needs vary, but generally adding 500 calories a day to your usual intake helps you gain 1 pound a week. If you get more calories than your body uses, the extra calories turn to fat, even if you're working out. The protein content may also be a bit much for some people. Protein needs range from 0.35 gram per pound of body weight for nonexercisers to 0.8 gram per pound for those who lift and train regularly. If you're a 180-pound person who lifts weights several times a week, you need 144 grams of protein a day, which means one serving of the weight gainer mixed with milk meets almost half of your daily protein needs. If you have to limit your protein intake due to a medical condition, such as kidney disease, ask your doctor before trying a weight gainer supplement, as it may not be safe for you. Specialty formulas for weight gain, like the one from Precision Engineered, are convenient but probably unnecessary for most healthy people. Making your own weight-gain shake gives you more control over the calorie and protein content, and all you need is a blender and some foods from the grocery store. Whip together a 6-ounce container of nonfat Greek yogurt with 1 cup of blackberries and 2 tablespoons of almond butter for a 360-calorie, 25-gram protein drink. Or blend a cup of strawberries, a medium banana, 1/2 cup of soft tofu and 2 tablespoons of peanut butter for a homemade weight-gain shake with 415 calories and 14 grams of protein. 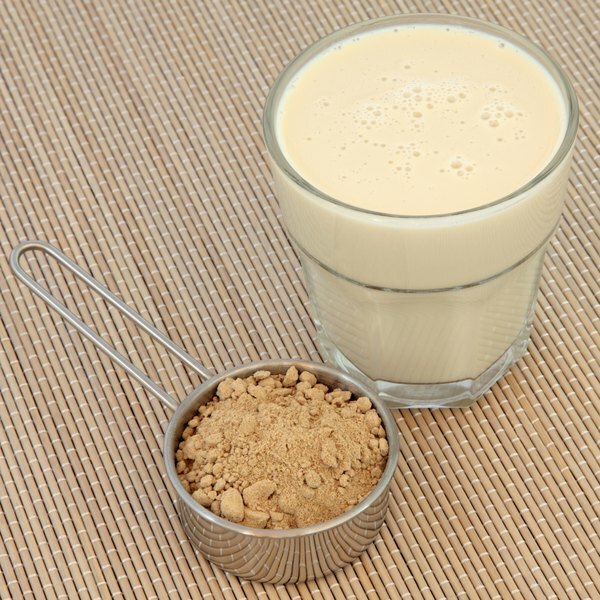 Will Soy Protein Powder Cause Weight Gain?